Callibrated for use in psychological experiments, with arrangement for accentuation of every 2nd, 3rd, 4th or 6th beat. Frequency of beats continuously variable from 40 to 210 beats per minute. Works on 3 dedium size dry cells of 1.5 V.Very low consumption ensures long cell Life. Cannot be used as a time switch. :: Single point and Multi point standardisation forConductivity, Resistivity, TDS and Salinitymeasurements using two-cell and four-cell probes. Built-in replatinising circuit. a circuit diagram is useful when testing a circuit and for understanding how it works. Reliable and cost effective of Low insulation fault of powerand pilot cables 5kV Murray Loop Bridge Model : MLB 5 1. DC Output 0-5KV 2. Short Circuit Current 50mA 3. Accuracy ± (0.2%L+1)m 4. Weight 9kg 5. Dimensions 420×360×190mm 6. 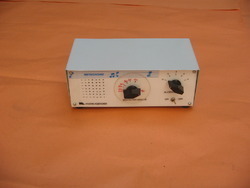 Power supply 220-240V±10%, 50Hz The discharge rod and the necessary connecting cables will be included in The scope of supply.